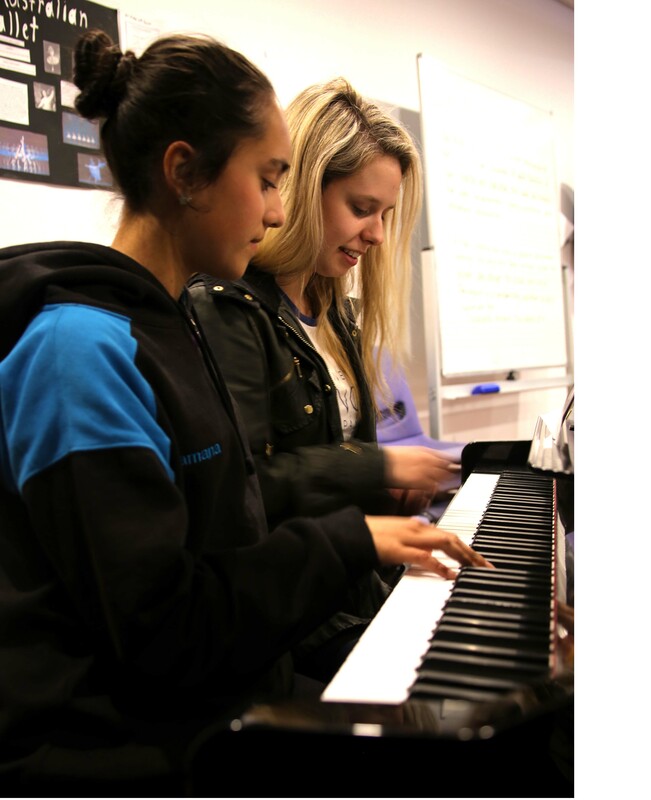 As a music and creative arts specialty high school, AIM Senior Secondary College provides students with the opportunity to study all of the creative arts, including HSC music, dance, drama, visual arts and academic subjects. AIM SSC caters to your child's individual strengths and talents within each subject, providing a focus on an academic approach to the creative arts as well as creating bodies of work or major projects that reflect their passion. The two-year HSC program effectively nurtures and allows students to reach their goals across a plethora of subjects, where students will learn the skills to become a practicing artist and industry professional. As well as achieving HSCs in academic fields that students have a true interest in, AIM's Senior Secondary College also provides a direct pathway for higher education within their chosen creative field. A unique advantage is that AIM SSC's Pathway Program exempts students from auditions for The Australian Institute of Music's Undergraduate Degrees, alleviating the stress of the unknown and preparing students for tertiary education. AIM SSC students are exposed to industry creative workshops and masterclasses throughout their pattern of study providing a robust foundation for a career in the music, arts and entertainment industry. The workshops, delivered by industry experts, teach students the technical, financial and business aspects and skills of the industry. Practical and performance masterclasses focus on everything from instrument to ensemble skills where students learn to collaborate with other artists and musicians, all whilst building confidence and ownership of their craft. Music Industry masterclasses provide students with the foundation essentials such as contracts, copywriting, and royalties. Students will also have plenty of performing opportunities to showcase the skills they've learnt each week. In addition to the HSC two-year pattern of study, AIM SSC students also attend Undergraduate Masterclasses twice a week. These masterclasses are delivered to tertiary Bachelor and Diploma students, meaning AIM SSC students gain invaluable exposure to industry experts delivering higher curriculum classes. Students have their own exclusive area separate from the AIM Undergraduate School which includes classrooms, lockers and digi-labs. SSC students also receive access to AIM's on-campus recording studios, rehearsal rooms, dance studios, music library and cafeteria. The Australian Institute of Music delivers 10 Week Short Courses in a variety of areas, including Music Composition (Songwriting and Ableton), Music Theory 101, Music Theatre, DJing, Contemporary and Instrument Skills. As part of the HSC curriculum, students have exclusive access to each of the short courses at no extra cost. The advantage of SSC students having access to any of the 10-week courses allows a total saving of $3,570 if they were to enroll for each Short Course. These courses are enabled to be a foundational stepping stone to prepare them for entry into higher education courses, as well as providing the opportunity to receive a letter of offer for early entry for AIM Tertiary degrees. AIM's Senior Secondary College is unique from other institutions for several reasons. Traditional academic subjects are supported by extracurricular programs dedicated to music and the creative arts. Smaller classes with more one-on-one time with the teachers means your child gets uninterrupted attention and nurturing so they reach their full creative potential. Students enter an 'adult learning environment' where they thrive in the independent setting. Due to the small nature of the school, staff strive to create an inspiring, caring and secure environment for students to flourish and exceed their creative goals. Students can undertake a Preliminary Year (Year 11) and a Higher School Certificate (HSC) (Year 12). In the Preliminary Year, students become familiar with the course structure, skills and content required to complete the HSC. Mornings are spent teaching NSW Education Standards Authority (NESA) subjects and afternoons are focused on Industry Workshops, Masterclasses and AIM's 10 week Short Courses in a variety of music and creative arts focussed areas. Students continue the foundation (compulsory) subjects in addition to three of the four subjects they chose for Year 11 to complete their HSC. They receive study periods to prepare for final assessments, and receive opportunities to perform in end-of-term musical productions, showcases and presentation ceremonies.